Are you using a spreadsheet to manage your customers? A long list of names, addresses? If so, you’re probably all too familiar with the time spent entering data and later and searching for it, or the hassle it takes to share information. They also don’t solve all your problems since they don’t help you track important things like emails, appointments or tasks. So what do you do? 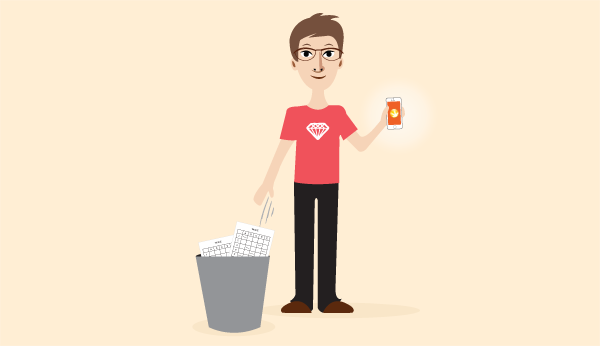 Its time you ditched the spreadsheet and move to a CRM for small business. “CRM,” stands for Customer Relations Management but the name only scratches at the surface of what a CRM can do. When you start using A CRM saves you time, helps you gain better insights, and your team will have less confusion and better communication. CRM does this by keeping all your data in one place which syncs with everyone who uses it. Many small businesses think CRM is just for the big guys, that they are too expensive or just too much for their needs. This may be a mistake holding your company back as you continue to use spreadsheets. Want to grow your business? Read the five reasons you should ditch the spreadsheet and start using a CRM for your small business. The more you use a spreadsheet to manage your business, the harder it gets it maintain and use. Spreadsheets were designed to handle data sets that you want to have manipulated or calculated, not store critical data, including notes and other information related to the customers and clients you meet daily. As your database grows, it becomes increasingly difficult to add information, pull out information and simply navigate through the ever-expanding number of columns and rows. Getting lost, and mistakes when doing data entry becomes an ever growing problem that only gets worse as time moves forward. CRMs, on the other hand, have been explicitly designed to store critical data about your customers in a way that is easily accessible. Now you have a way to keep information about your customers, sales, etc. that will grow with your business. This ease of use will ensure that your team uses it more, reinforcing this benefit and they will make fewer mistakes because they have a simple interface no matter the scale, saving you an enormous amount of time and trouble. While it is common for businesses to use spreadsheets for managing their contact lists, in a lot of ways they are just glorified lists of information! Spreadsheets are missing critical features that a CRMs have because managing people, and the things around is not what a spreadsheet was designed to do. Features like linking emails, appointments, automated reminders just don’t happen in spreadsheets. Connecting sales to the clients and salespeople, advanced filtering and reports are not possible or at least, easily done and with a spreadsheet. When you starting using a CRM, you get features that are designed to help you build better, and more relationships with your customers so you can reach your goals. Since they are more than just a list of information, you can have your data work for you and help you achieve your goals. With built-in and custom reports, you can gain new insights into your client and learn how to grow your business more effectively. Getting automated reminders for tasks and appointments, and keeping a history of all the things you do with your clients will help you ensure that you can get more done and win more business. Does this sound familiar? Multiple copies of a spreadsheet, chasing people down or going through the complicated steps of setting up file sharing? When you have a single spreadsheet to manage customers, your team may start to copy the file, and suddenly you have multiple copies, each with different sets of information. The confusion and time spent trying to consolidate these lists are a waste of your company’s resources. Your team should be focusing on closing deals and working hard to help grow your business. To avoid this, you can try to set up file sharing but it is tricky and while you can use shared documents online like Dropbox or Google Sheets, losing links is a common frustration. What you need is a more effective way to share information with your whole team. The structure of your business will vary, but one thing is sure: building a strong business is a team effort. Like a relay race, each of your team members picks up the baton at different points, and the more seamless your business runs, the better you have at beating the competition. A CRM gives you a centralized place for customer details, interactions, files and even more. Now your team can work quickly, without interruption, and have more confidence because they have the information they need at their fingertips whenever they need it. When’s the last time you’ve tried searching for a note about a customer in your spreadsheet? It probably took a long time, didn’t it? When you use a spreadsheet to hold all your valuable customer data, and you need to search for something you’re either stuck scrolling through thousands of records or using the find command. As a manager or business owner, there is another way to describe this process: wasted time. This time wasting will mean your team is putting less essential data in because there is no way to get it out and of course when you do need it, who knows if you can find it? When you upgrade your business from spreadsheet to a CRM, you can find what you need when you need it. Whether you’re searching for information while on the call with a customer, doing research, whatever it may be, getting the information you need right away is crucial. When you switch to CRM, searching becomes easy and quick because it is designed to give you the answer you need and not just store information in a spreadsheet. Chasing files, lists and forgetting things is just a part of running a business off spreadsheets. That’s because one, single massive spreadsheet isn’t feasible. Just opening one can take ages, they don’t share well, and search is impossible. Keeping track of things like when to follow-up or when you’re next meeting is in a spreadsheet? Forget it. So, what do you do? Inevitably, you need to break things up into multiple spreadsheets and multiple apps. With your data spread out all over the place, you’ll be jumping around between apps, losing track of things and spending valuable mental bandwidth just recalling where things are. Hopefully, you don’t forget. On the other hand, having everything in one place lets you get more done with less switching. Because a CRM like Daylite keeps your appointments, tasks, sales opportunities, projects and people linked together and all in one place, you don’t need to worry about forgetting details about your customers or even your workload. With everything you and your team needs at their fingertips, they can save time by avoiding app switching or wondering where some critical bit of information is. If you’re using a spreadsheet to manage your customers or your sales, you’re tying your hands behind your back. You want to achieve your goals, but spreadsheets weren’t meant for this. Check out how a CRM like Daylite can increase how much you can do in a day, and help you make better decisions than ever before. See how effective your team will be when they have the best tools at hand.